As part of a sophisticated mixed-reality installation, BMW will immerse visitors to Mobile World Congress 2019 in application scenarios where they can experience the customer benefits of BMW Natural Interaction for themselves hands-on. 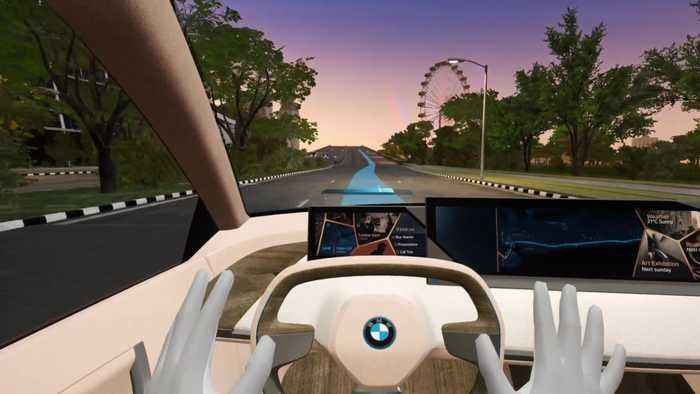 A specially-designed spatial concept and virtual-reality goggles are used to create a thoroughly realistic experience that showcases the new possibilities during a virtual ride in the BMW Vision iNEXT. Visitors discover the previously unknown freedom of gesture control throughout the area detected by the gesture camera, which extends across the entire width of the front vehicle interior. Initially, in training mode, directional detection of the pointing gesture is visualised by a dynamic light pulse that follows the direction. Objects the driver can interact with via pointing are then highlighted. Just how natural this interaction is becomes apparent in the simple combination of gesture and language. For example, if the driver points to a side window, this is visually highlighted with a frame and the voice command "Open" will then open the chosen window. These totally new possibilities for interaction with the immediate environment are revealed during an automated journey through a futuristic city the driver is unfamiliar with. The vehicle takes over driving and the visitor embarks on a sightseeing tour of a very different kind – simply pointing at buildings to obtain all the information they need about events and exhibitions. Towards the end of the ride, the user reserves tickets for a cinema they drive by along their route and streams the trailer for the film directly into the vehicle.